This past fall I booked my plane ticket, shouldered my backpack and jetted off to Europe. 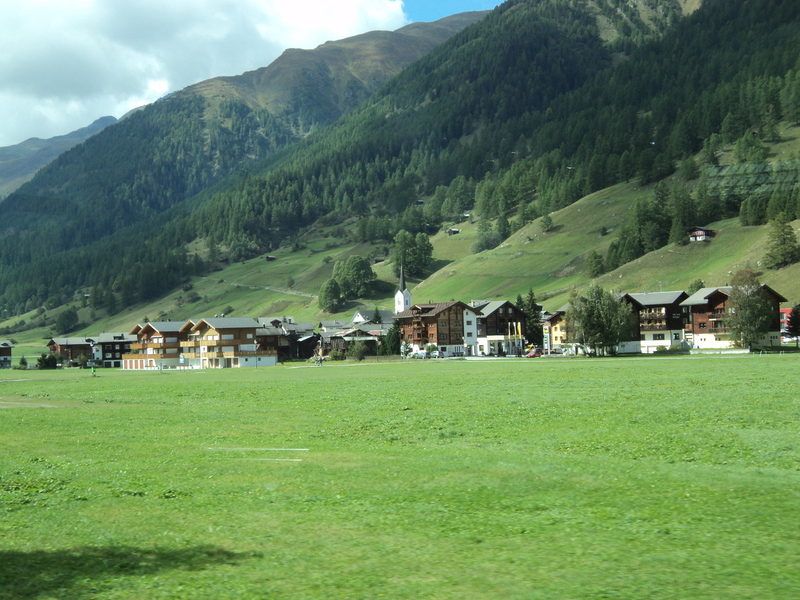 My first stop was Switzerland, “a small but very beautiful country,” a Swiss local told me as we landed in Zurich. It truly is. This postcard-perfect region has unmistakeable European flair: from the houses, to the food, to the rolling hills and snow-peaked Alps. The Swiss I met were driven, proud and loved their country. This national pride also means that young and old are knowledgeable about Switzerland—and eager to share information with tourists. We have friends and relatives in Switzerland so I got the locals’ tour during my stay including visits to a couple of dairy farms which, as a farm girl, I thoroughly enjoyed. According to the federal Swiss government there are over 2,000,000 acres being used for farming (not just for dairy but all commodities) with an average of 52 acres per farm. This is an increase of 28 acres per farm from 1990. However, the number of farms has decreased since 1990. This trend—also seen here in Canada—has resulted in fewer, larger sized farms. Farming is still considered a valuable part of Swiss culture, and continues to conserve the countryside and populate rural areas. Most farms in Switzerland are family owned and operated (another Canadian parallel). Family farms assure the need for a school in a rural area, possibly a church and stores for food and supplies, as well as link to the regional train network. Slowly and surely a community is built. 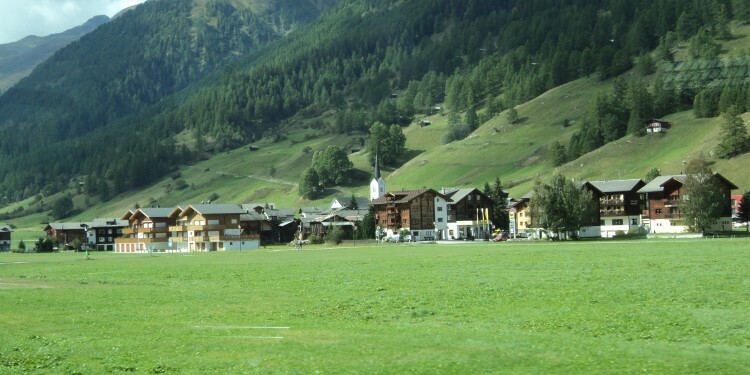 Three quarters of Switzerland’s pastoral farmland is dedicated to meadows and pastures. Their climate means cattle can graze in the spring, summer and early fall. The most common dairy cattle that saunter along these sunny slopes are the Brown Swiss and beige Simmentaler breeds. Canada’s common black and white Holsteins are also in Switzerland but in the French region. On the country’s website, Swissworld.org, a 2010 study tallied the Swiss cattle population (dairy cows, heifers, calves, bulls and oxen) at 1,600,000. Dairy cows are 700,315 of the total and—fast fact—the pig population is nearly equal to these dairy numbers. A distinctive aspect of Swiss farming is the blend of past and present. A farm I visited demonstrated this perfectly. They milked sixty Brown Swiss near Lucerne and owned flat and steep property. On their level fields this family (mother, father and four teenagers) used their John Deere tractors and regular sized equipment to mow, rake, bale and plant their fields. On their mountain slopes they used walk-behind mowers and hand raked windrows together to be loaded, by hand, onto a hay wagon. Within their older style dairy barn they had installed a DeLaval robot and a DeLaval feeding system. This automated system collects ingredients from pre-filled bins, mixes the load and then moves along a hanging track parallel to the feed alley. This technology feeds the cows smaller amounts, more frequently, keeping the feed as fresh as possible. Both DeLaval systems are an appreciated counterbalance to their long, manual work done on the mountains. Cheese, chocolate and pocketknives are abundant in Switzerland and on the dairy farms I toured—and in town—I saw all three (and indulged generously in two). Cheese making is another example of old traditions meet new technology. Many farms still participate in Inalpe or the ascent into the Alps in the late spring and early summer with their cows. Today, village cooperatives own these alpine pastures and one dairyman or herdsman and his helper look after cows from several local farms. As the season progresses, the cows climb up to higher pastures, and once at the top work their way back down to the lower, regrown fields. A 14 hour day, for four months is intensive especially when you add cheese making into the mix. The cows are milked twice a day and the milk is turned into cheese to be stored. Ten litres of milk can make one kilogram of cheese and the weight of an average sized cheese wheel is 30 kilograms. By late September herds begin their descent, and tourists crowd the small town streets as the cows are herded through, wearing decorative cowbells that clang jubilantly announcing the end of a—hopefully—successful season. The final Alp event is Chästeilet or dividing of the cheese. Whatever cheese was produced is split among the farmers who sent their cows to the mountains. How many wheels a family gets depends on how many litres their cows milked. This tradition of taking cows into the mountains—although happening for hundreds of years—is in-tune with an increasing interest in organics. Swissworld.org states that of all the European countries, Switzerland and Austria have the most useable land given to organic farming. The Swiss consumers’ concern for organics also means more regulations, an area where the Swiss are leaders. Any addition of antibiotics to animal feed has been banned since 1998 and, as with Canadian dairy farms, the use of hormones is also forbidden. Nonetheless, farming in Switzerland is not all idyllic green pastures and cowbells. The strict regulations put on farmers today has only added pressure when it comes to producing food at prices that consumers are willing to pay. It’s not easy for Swiss farmers to make a living. Government statistics claim that more than two-thirds of farms receive supplemental income to cover daily expenses and one-fifth of all farms take more than half their income from non-agricultural sources. Direct farming subsidies amount to over $2.8 billion a year in Switzerland and similar financial aid is seen across all of Europe. This does not need to be the status quo: Canadian dairy farmers (and other Canadian supply-managed sectors) are self-sufficient and not dependent on subsidies from the government. The supply management system we have in Canada—in the simplest form—guarantees farmers a set demand (and price) for their product and, in turn, guarantees processors (and consumers) a steady supply. Farmers have a reliable cash flow to invest in their industry and family business while giving the next generation the opportunity to continue farming. The absence of supply management in Switzerland is causing a worrisome shift: young people are not choosing to farm. The Swiss Federal Statistics Office noted that between 2000 and 2013 less people were employed by farms (not to mention the trend of fewer farms all around). A study done by the Federal Institute of Technology in Zurich concluded that, with cuts in agriculture subsidies, farmers would be more profitable to milk fewer cows and instead raise cattle for meat. The study claims this would be a less labour intensive option with a higher return. The landscape of Swiss farming—dairy included—is definitely changing, but the Swiss local I met on the plane is right, this physically small country is still very beautiful and, now I can add, it’s also a sight to see.